Newly revised, updated, and redesigned for 2017. True to its name, DK Eyewitness Travel Guide: Top 10 Cuba covers all the island nation's major sights and attractions in easy-to-use "top 10" lists that help you plan the vacation that's right for you. This newly updated pocket travel guide for Cuba will lead you straight to the best attractions the country has to offer, from its extensive arts scene and bold architecture to its beautiful mountain ranges to its fascinating history and strong cultural traditions of music and salsa. 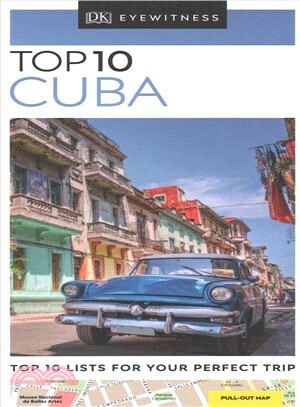 Expert travel writers have fully revised this edition of DK Eyewitness Travel Guide: Top 10 Cuba. • Brand-new itineraries help you plan your trip to Cuba. You'll still find DK's famous full-color photography and museum floor plans, along with just the right amount of coverage of the country's history and culture. A free pull-out city map is marked with sights from the guidebook and includes a street index and a metro map. The perfect pocket-size travel companion: DK Eyewitness Travel Guide: Top 10 Cuba. Recommended: For an in-depth guidebook to Cuba, check out DK Eyewitness Travel Guide: Cuba, which offers a complete overview of this island nation; thousands of photographs, illustrations, and maps; and more.